After rebounding from upper target levels, Eurodollar started consolidating. Probably, it nearest future current descending correction may continue up to level of 50%. If later price breaks, market may start deeper correction. As we can see at H1 chart, price reached its upper target levels right inside temporary fibo-zone. After that, local correction reached level of 78.6%. Possibly, in the nearest future price may continue moving towards level of 50%. At H4 chart, Franc is trying to rebound from lower levels again. I’ll move stop on my buy order into the black as soon as market breaks local maximum. Short-term target is at level of 50%. 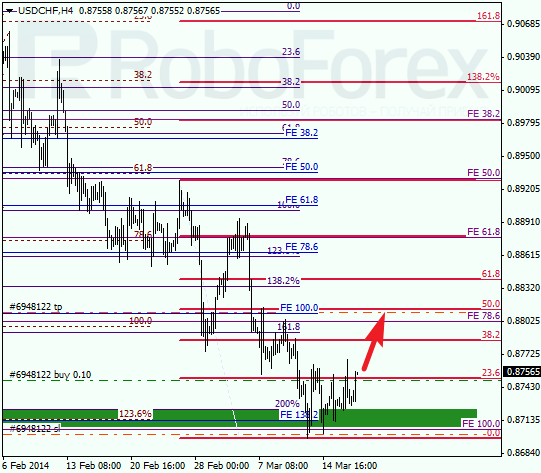 At H1 chart we can see, price rebounded from lower targets right inside temporary fibo-zone. 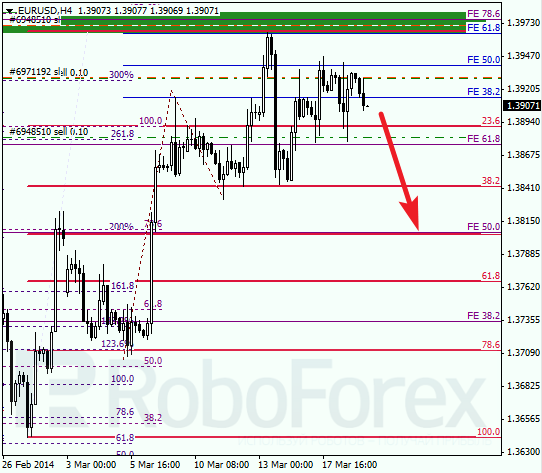 Closest target is at level of 0.8810, where there are several additional fibo levels. After reaching them, pair may start new correction.